Reverse mortgage software and technology provider ReverseVision announced today that it will host its second annual user conference February 8-10, 2017 at the Hilton San Diego Resort and Spa. Over the course of three days, UserCon 2017 will provide attendees with educational programming, financial product sales training, networking opportunities and vendor exhibits tailored for industry newcomers as well as seasoned reverse mortgage loan originators and operations personnel, ReverseVision stated in a release issued Wednesday. The kicks off Wednesday, February 8, with ReverseVision’s “Facts Track” session, a two-hour crash course in reverse mortgage lending. A cocktail welcome reception for all attendees will follow the newcomers-only Facts Track session. 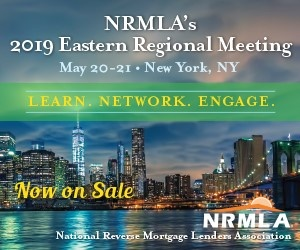 Thursday morning’s general sessions will feature welcoming remarks, a keynote address from a yet-to-be-announced speaker and coverage of the latest reverse mortgage industry trends. After a lunch period, attendees will have the opportunity to address software questions to a live team of ReverseVision software technicians before attending concurrent tracks of customized programming for loan originators and operations staff. The conference will conclude Friday, Feb. 10, with several general sessions until noon, followed by an optional loan originator certification session. In preparation for UserCon 2017, ReverseVision applied feedback from last year’s inaugural event in efforts to make the second go-around even more successful, said Wendy Peel, vice president of sales and marketing at ReverseVision. ReverseVision is currently soliciting early-bird registration through October 31, 2016. Attendees may choose to bundle their registration with the Elite Package, which includes discounted conference registration and hotel rates, and a 10% annual savings off ReverseVision’s RV Sales Accelerator (RVSA) Premium. The conference is also accepting speaking proposals through November 30, 2016. For anyone interested, contact ReverseVision for more information at connect(at)reversevision.com.